It was an afternoon in March and also the wedding day for bride and groom, Jillian and Matthew. It was an overcast day filled with bright colors and cacti. The wedding took place at Desert Botanical Garden and there was a pre-party bridal shoot at the Saguaro Hotel in old town Scottsdale. 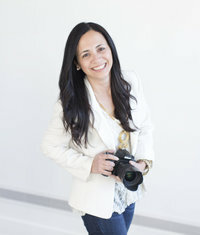 As the second shooter to Ashley LaPrade, it gave me a unique perspective as a photographer. Pops of tangerine, lime, lemon and hot pink were covered on not only the hotel walls but throughout the bridal bouquets and boutineers. With a mid-century modern, retro flair, the details were worth taking note of. 1970’s beach cruisers and draping florals at every turn gave natural, retro beauty to the desert venue. All would agree, no piece was left untouched. There was even an essence of old Hollywood glam, reminiscent in Jillian’s stunning deep v back wedding gown and uniquely woven veil. 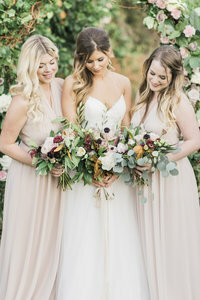 Flowy, neutral gray bridesmaid dresses let the colorful wedding and cacti landscape be the center of attention. At the end of the night, after dancing away under the stars, the couple rode off in their vintage blue chevrolet chevelle, and the rest is history.